Welcome to The Legendary Starfy Wiki! The wiki about The Legendary Starfy series (Japanese: 伝説のスタフィー シリーズ) that anyone can edit! The wiki has been hard at work since May 30, 2009 and has so far created 1,356 articles! The success of the The Legendary Starfy series has contributed to the production of additional games in the franchise. Various merchandise have been released to promote these games, including both retail products and not for sale merchandise. Additionally, mangaka have produced manga based on games in the The Legendary Starfy series and there have been a few products available in capsule machines for multiple Nintendo games including most games in the series. There are also various publications like Famitsu and Nintendo Power that cover the series in certain volumes and may be considered Legendary Starfy merchandise. This article lists officially licensed merchandise by Nintendo, promotional items and manga from mangaka. It will not list fan-made works. December 7, 2018 - Super Smash Bros. Ultimate is released worldwide! November 1, 2018 - At least Starfy, Starly and Moe (with their The Legendary Starfy artwork), among many other spirits from different video games series, are confirmed as spirits in Super Smash Bros. Ultimate's Spirits mode, featured in a Super Smash Bros. Nintendo Direct presentation. June 12, 2018 - During a Nintendo Direct presentation for E3, the game Super Smash Bros. Ultimate was revealed for Nintendo Switch, which was previously in development as an unnamed Super Smash Bros. game (also for Nintendo Switch). In this presentation, Starfy was confirmed as a returning Assist Trophy. May 14, 2018 - The trademarks for The Legendary Starfy and various other Nintendo IPs have been renewed. March 8, 2018 - A version of Super Smash Bros. for Nintendo Switch has been announced in today's Nintendo Direct. It is not known whether this is a new game or port of an older game, or if Starfy will make another appearance in the Super Smash Bros. series yet. January 6, 2018 - Autumchild starts a series of YouTube videos for the fan translation of Densetsu no Starfy 4. Starfy is neither a star or a starfish. When TOSE are asked whether Starfy is a star or a starfish, their policy is to respond that he is neither. 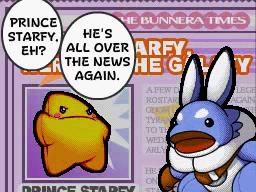 Starfy made a cameo as an elusive enemy named "Starfish" in the Nintendo DS Mario game Super Princess Peach, likely because Super Princess Peach was co-developed by TOSE and Nintendo. In Densetsu no Starfy 3, Wario from the Mario series and his own Wario series makes an appearance as an ally of Starfy, where he helps him get through the Undersea Ruins with three of his transformations; Flaming Wario, Bubble Wario and Puffy Wario. He also teaches Starfy's equivalent of his Ground Pound ability; an enhanced version of the Shooting Star ability. Konk, the first secret boss of the The Legendary Starfy is actually a recurring character and enemy/rival of Starfy in the Legendary Starfy series who has acted as the first boss in every Japan-only game. In Mario & Luigi: Superstar Saga, Starfy makes a cameo appearance on a movie poster titled Legend of Stafy. During the year 2000, Densetsu no Starfy was planned to be released for Game Boy Color but the game was re-built for the Game Boy Advance, with a few differences. Known differences in the gameplay of the Nintendo Space World 2000 trial demo include "Kyorosuke" originally being called "Kyororon", the inclusion of a working debug menu, the apparent lack of the Extra! screen and a different design for doors. In the Japanese version of Donkey Konga, one of the available songs is "Densetsu no Starfy". It is actually the Legendary Starfy series Title Song (also known as Tone of Ocean) sung by Becky. Tone of Ocean is the main theme of the The Legendary Starfy series. In Densetsu no Starfy 4, there is a Special category costume (one of the Stuff) for Starfy and Starly called Princess and Umbrella that is based on Princess Peach. Starfy or Starly also holds Perry, the parasol from Super Princess Peach. The costume was one of the winning designs of the Wanted Kisekae contest, a contest where people would send in their designs for Stuff to Nintendo's headquarters, with a chance of the designs appearing in the final game in some way, either as one of the actual Specials or in the Staff Roll 1. "Princess and Umbrella" was designed by Eriko Kawashima. Starfy, Starly and Moe own a Wii, known as the "Fii" with a game resembling Wii Sports in the Densetsu no Starfy R manga. Satomi Kōrogi, the voice actress of Starfy and the Mermaid is also the voice actress of Pokémon such as Pichu and Togepi. Do you like the Legendary Starfy series? Check out these links! If you have any questions or site suggestions, please contact Torchickens, the editor in chief. Starfy Wiki is a member of NIWA. NIWA is a group of unofficial, fan-run open-content encyclopedias based on Nintendo franchises. This page was last modified on 5 January 2015, at 00:14.